Tough leaders, resilient workers and generations of picket line battles are featured in this fast-paced survey of 150 years of British Columbia labour history. Author Rod Mickleberg worked the ‘labour beat’ at the Vancouver Sun and Province newspapers for 16 years. His reportage folds neatly into these chronicles about a province rooted in a resource-based frontier economy of forestry, mining and fishing. Thoroughly researched, sources include those gathered by the BC Labour Heritage Centre, instigator of this book project, with sponsorship by the Community Savings Credit Union. Over 200 archival photographs and several sidebar stories accompany the text as well. So begins my review of Rod Mickleburg’s comprehensive look at BC labour history in the winter issue of Our Times. 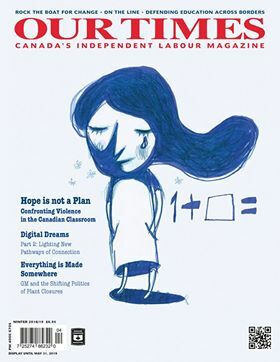 Disclosure: I assisted with some of the research on the role of women in the labour movement–one of many to contribute toward this important work. For the full book review, check out Our Times magazine, Winter 2019 issue, available soon in bookstores across Canada and by subscription. An on-line site, Between Times, offers great labour articles too. This entry was posted on February 20, 2019 at 8:18 pm and is filed under Book Reviews. You can follow any responses to this entry through the RSS 2.0 feed. You can leave a response, or trackback from your own site.